The Happy Barn Milkshake Factory has been such a hype since its opening in Las Pinas City last July. The people from the South were really thrilled about it but left us “northern” people feeling envious of this new found sweet spot… well not anymore! Just last Sept. 8, the 2nd branch of the Happy Barn Milkshake Factory opened up in Rockwell, and I was sure to check it out. When in Manila, go visit the Happy Barn Milkshake Factory in the Powerplant Mall and start drinking happy thoughts. I’ve been hearing a lot of good things about the Happy Barn Milkshake Factory in Las Pinas. I heard it was one of the best milkshake places and a must visit. I was sad that I won’t be able to experience it though since I live all the way in the heart of Manila. Imagine my joy when I heard they were opening their second branch in Manila, specifically at the Rockwell Powerplant Mall. I knew I couldn’t waste another day of not tasting that creamy goodness! Along with 5 other friends, we headed over to Rockwell one Saturday morning to finally find out the hype about Happy Barn Milkshake Factory. 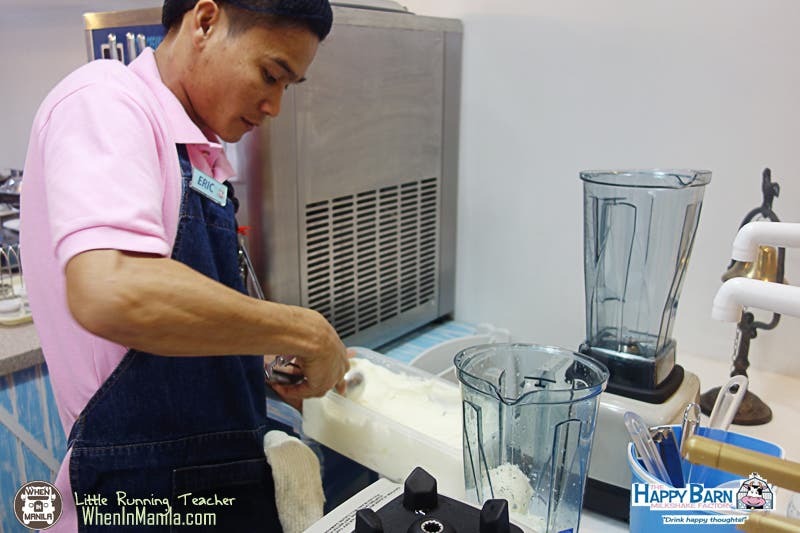 The Happy Barn Milkshake Factory is located inside the Rustan’s Marketplace on the ground floor of the Powerplant Mall. They only have a small place in the grocery store, but the way their spot is designed makes me wish the entire place was decorated that way. True to its barn theme, the new store is designed to look as if you were really inside a barn with white-washed wood, milk bottles, wood barrels and crate decors. The Happy Barn Milkshake Factory looks really simple from this angle, but walk a few steps closer and voila! Happy thoughts! Doesn’t that just look so relaxing to the eyes? Seeing it makes me feel like a little girl once more and I just wanna rush inside and play! (heehee) The Happy Barn Milkshake only has a small area at the moment, but I sure look forward to the day I get to “play” inside their barn! The Happy Barn Milkshake Factory uses their own ice cream in making their shakes. The reason is that they want to be able to control the calories in their drinks. They only use skimmed milk for their ice cream and shakes. They’re ice cream is also sugar-free and contains 98% less fat than others. Moreover, the Happy Barn Milkshake Factory is the only restaurant that serves milkshakes fortified with prebiotics. Prebiotics aids with digestion and calcium absorption. So not only do you feel happy with every sip, but so does your tummy. Sweet, delicious and HEALTHY milkshakes… doesn’t get better than this. The Happy Barn Milkshake Factory has several flavors for you to choose from. Apart from their already delicious shakes, you can also customize your own by adding or removing your choice of ingredients. Mmmm…. those chocnuts are soooo tempting! My friends and I got to try several flavors from the Happy Barn Milkshake Factory! Each flavor tasted really good that we couldn’t choose our favorites! Everything was just filled with flavor and sweetness. Check out the next page to see the different flavors The Happy Barn Milkshake Factory has to offer. SPAM Musubi, Kani Tempura and Gummy Bear Cocktails at Happy Hour Manila! 3 New MUST TRY Restos at Uptown Mall at The Fort!